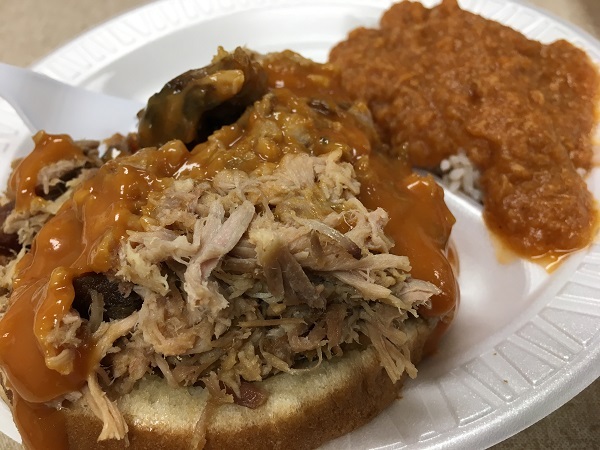 Dukes Bar-B-Que, Orangeburg SC – Marie, Let's Eat! The sun had set and we raced against the clock to make it to our final stop of the day, one of about twelve locations of a very loosely-connected quasi-chain called Dukes. We visited the one that people describe as “by the Pepsi plant,” even though that plant closed years ago. How helpful! 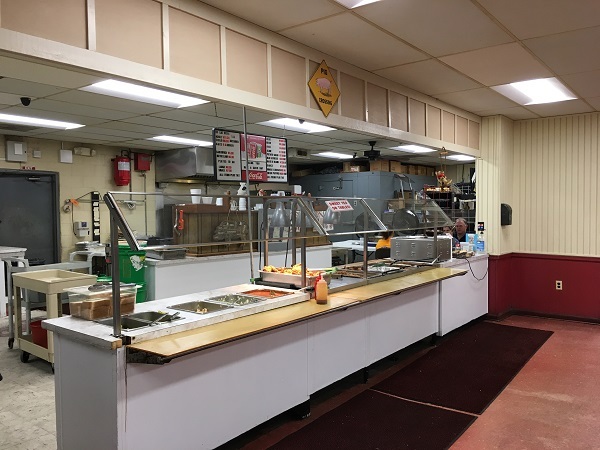 There have been more than twenty locations of Dukes Bar-B-Que over the years, and perhaps a dozen still in business today. Each one is independently owned and operated, each one started by somebody with a tie to the Dukes family. Earl Dukes opened the first of these restaurants in Orangeburg in the 1950s, and I bet that spending a few weeks tracing all the history and eating at all the locations in the southern half of South Carolina would be a fascinating and fun little expedition. Robert Moss, writing for the Charleston City Paper (link below), assembled the best history of the chain that I could find, and if it doesn’t leave you ready to gas up the car and drive to South Carolina immediately, something might be wrong with you. Speaking of South Carolina, sure, every state has dying little towns whose only real revenue stream these days is speeding tickets, but I swear 90% of them are in the Palmetto State. Anyway, the Dukes quasi-chain reminds me very much of the various Gibson establishments around Huntsville and Decatur AL. I wasn’t sure which one to visit, so I let Google pick for me, and happily, it picked one that stayed open until nine, because we had to cover a lot of miles that Friday and arrived a little after eight. Marie and our son were mostly stuffed from Sweatman’s, so the boychild just had dessert and a grape soda, and I had a really good sandwich. Many of South Carolina’s buffet places are a little unfriendly to people who just want to eat a sandwich, asking that you use a separate take-out window for that and get on your way. Happily, this location of Dukes is not like those. You can order a buffet plate, or you can just get a sandwich and a side. I was interested to note that they do have a walk-up window on the side of the building, and briefly wondered whether we’d be eating in the car. Happily, they were able to serve us inside. I don’t object to eating in Marie’s car, but on a day like that Friday, I wanted to park it and walk away from it! As mentioned in the previous story, there are at least two different kinds of mustard sauce to be found in the South Carolina midlands. Dukes is evidently the best place to sample the lesser-known orange sauce, which seems to have a little honey in it and is sweeter than the more common yellow variety. I thought it was really delicious and mixed very well with the pork. The pork is smoky and the sauce is sweet and just a little tangy. I was very pleased with it, and really enjoyed the hash. That’s one thing I certainly miss about moving to Tennessee. We’re a little bit closer to a sandwich at Payne’s or chipped mutton in Owensboro, but we’re farther away from good hash and rice. For our experience, Dukes kind of came a distant third of the three places we visited that Friday, but be fair; we visited both Skylight Inn and Sweatman’s that day. Just about any restaurant on the planet would suffer by comparison. I’d love to visit a Dukes location again; I’d love to visit all of them. But not this trip; it was late and the road had absolutely killed us on this Friday. The hotel was fifty miles away in Columbia. We all crashed into very long and very peaceful slumber. Posted on November 30, 2016 by Grant G.Posted in barbecue, lowcountry, south carolinaTagged barbecue, lowcountry, mustard sauce, orangeburg, south carolina.